Don't throw away the seeds from your pumpkin this Halloween – turn them into a tasty snack with this easy recipe for leftover pumpkin seeds. 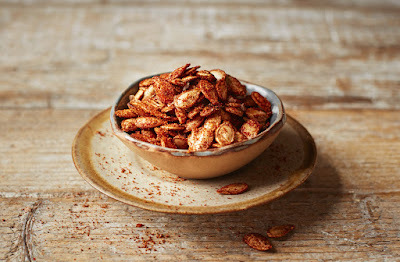 Cumin and smoked paprika add gentle spice to the toasted seeds, which turn crispy when roasted in the oven. Serve as a simple snack or scatter over salads and soups for a little extra crunch. Preheat the oven to gas 4, 180°C, fan 160°C. Scoop out 80g of raw pumpkin seeds from the flesh. Remove any stringy bits from the seeds and rinse well with cold water. Pat dry with kitchen paper, removing as much moisture as possible. Toss the seeds in a bowl with the oil, cumin, paprika and salt until evenly coated. Spread out on a baking tray and roast for 10 mins. Allow to cool before serving.